After former BYU linebacker Francis Bernard practiced Monday for the first time in Utah's preseason camp, Ute defensive coordinator Morgan Scalley counted the number of players he's comfortable using in games at that position. He got to six, including Bernard. That's a big number, considering Utah's standard defensive alignment employs only two linebackers in a position group that went from “kind of a question mark” to one of the team's deepest areas, Scalley said. So the next questions are how much Bernard will be on the field this season and how soon that may happen. The Utes' depth suggests if he plays very much, that will be a good sign of his ability. Breaking into the linebacking rotation is “not undoable” at this stage, coach Kyle Whittingham said, more than two weeks before the Aug. 30 season opener vs. Weber State. Utah did not make Bernard available for interviews Monday. Bernard, a Herriman High School alumnus, has two years of eligibility remaining. He played running back as a BYU freshman in 2015 and moved to linebacker in 2016, when he recorded 79 tackles and three interceptions before missing the Poinsettia Bowl vs. Wyoming due to off-field issues. While sitting out last season, intending to transfer, Bernard was arrested in October. He was fined $1,420 and sentenced to 48 hours of community service on a conviction of impaired driving, a Class B misdemeanor, Utah County Justice Court records show. 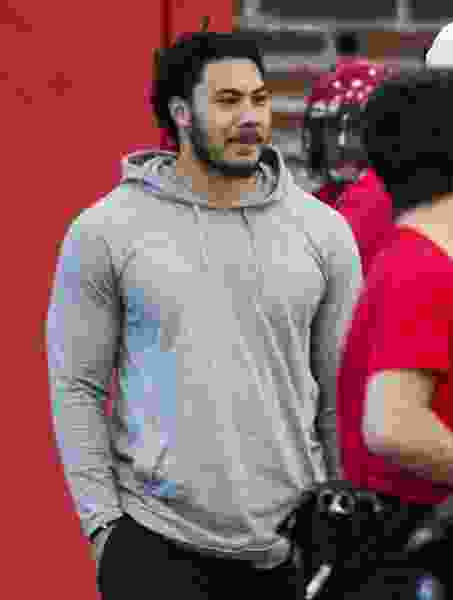 Whittingham said Bernard has met conditions to join the Utes, beyond his academic work, and is confident the linebacker will adapt to Utah’s expectations. Darren Carrington II, who led the Utes in receiving last season as a graduate transfer from Oregon, is among players with past legal issues who have succeeded in the program. “The mentality here is conductive to coming in and, for the most part, doing what's right,” Whittingham said. Due to the NCAA's acclimation period, Bernard won't wear pads in practice until Wednesday. Utah's preseason depth chart listed senior Chase Hansen and redshirt freshman Devin Lloyd at Rover and senior Cody Barton and junior Donavan Thompson at the Mac linebacker. The positions are interchangeable, Scalley said, with Thompson considered the No. 3 linebacker overall. In the first media session since Saturday's scrimmage, Whittingham mentioned the receivers' strong performance, the defense's solid tackling and Matt Gay's 62-yard field goal as highlights. Scalley was disappointed with the defense's showing inside the 20-yard line, but he liked the way the line pressured the quarterbacks. Offensive coordinator Troy Taylor, though, said he was happy with the offensive line's pass protection.